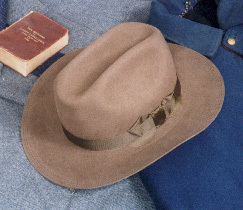 A wool felt body in the correct color and weight material, with regulation style hat ribbon, snowflake vents, three row brim stitching and genuine leather sweat band. These hats are very accurate reproductions. Available in sizes 6 7/8 through 7 5/8. 1889 Campaign Hats - wool - left hat is the tall crown and right hat is the regulation crown. The tall crown hats allow more radical shaping. Hats larger than 7 1/2 are only available in the tall crown. 1889 Campaign Hats - wool - The left hat is my 2 year old tall crown hat. The right hat is the regulation crown. Once shaped down, there is little apparent difference in the two crown heights. Very apparent however, is the fading and soiling that has occurred with two years of daily use, rain or shine.